There had been a short presentation given on Heart of the City Ministries during our previous week's church service. I, frankly, was not over enthusiastic about attending, assuming that it would be a little to "ecumenical" for my taste, but my wife insisted. As so often happens, Jane was right and I was wrong (and if I put that in print a little more often, she will likely become an avid reader of my blog). Any thoughts that the whole event would be "lukewarm" (see Revelation 3:16) due to the stated purpose of Heart of the City to "bring together the body of Christ" were dashed when one of the singers gave his salvation testimony. It was one of those that make you want to jump up and say AMEN; one where you have no doubt that the man had been born again. Yep, he even brought up that it was God's law that showed him what a sinner he was and how in need of Savior! No, I certainly got the feeling this was not one of those ministries that would sacrifice truth for the sake of unity. That can be a narrow road to walk, and may God bless Heart of the City's effort to stay upon it. Sometimes its tempting to make that path so narrow that there is only room for one person on it. If you have been working on Harleys as long as I have, you may already have one of these laying in the junk drawer of your tool box. Simply use a ratchet with socket to screw the tool into the bushing and then drive it out from the other side with a punch (note the mushroomed end) I have been using the same one for over 15 years with great results. A normal tap might work, but will not be as easy to start straight and will likely shatter after a few times hitting it with a punch. I attended a funeral this past week, but this post has nothing to do with the deceased. Rather I would like to address something I noticed in passing. Hanging on one of the walls of the church where the service was held was a "tapestry" (if I am using the word correctly). You have probably seen similar ones if you visit many churches, or may even have some on the walls of your church. Usually they have a solid colored background with some sort of images on them along with a line or two of text declaring something theological. This particular one caught my eye because it stated something to the effect of "You need to continue with bible study until the day you meet the author"
Now I know as well as anyone the danger of "bumper sticker theology". Its just too easy read into a one line text nearly any thing you want it to say. If all truth could be conveyed in just a line or two, then certainly our Lord would not have given us so many books in the Bible. And believe me, I understand what was meant by this saying. Clearly it was meant to mean that we will never know enough about God's word until the day we die. However, that didn't stop me from critiquing the saying in my mind. I will certainly admit to the tendency of being overly critical of things spiritual that are coming from a source with doctrine that I disagree with. In many cases I do think I would do better to practice Christian charity by giving others the benefit of the doubt as to their intended meaning. In this case though, I know that the intended meaning was right and a nice positive message, but the saying still brought a negative rebuttal to my mind; "If you haven't met the author before you die, it will be too late." You see, all that Bible study will have done you no good if you have never met the author. In Matthew 7:21-23 Jesus said; "Not every one that saith unto me, Lord, Lord, shall enter into the kingdom of heaven; but he that doeth the will of my Father which is in heaven. Many will say to me in that day, Lord, Lord, have we not prophesied in thy name? and in thy name have cast out devils? and in thy name done many wonderful works? And then will I profess unto them, I never knew you: depart from me, ye that work iniquity. " This passage of scripture should be enough to give every one pause! Have we not prophesied in thy name? And have we not cast out devils? (actually I have done neither of those first two things) And have we not diligently gone to Bible studies? And have not we been baptized in thy name? And yet despite all these wonderful works, Jesus will say in that day that he never knew them. Are you sure that you have already met the author? 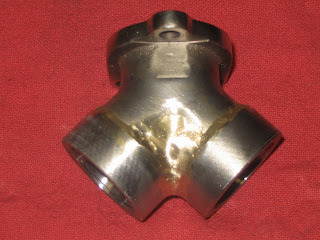 This is the 6th in a series of posts on a flathead big twin engine build that I am doing in my shop. 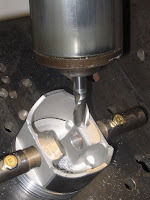 The series starts with Stroker Flathead Engine Build , and last post was Relieving the Flathead . Once the rods are rebuilt, and the cylinders are bored it is time to mock up the engine and do some clearancing for the stroker. 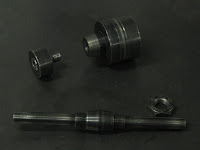 Because of the extra stroke, the relationship between the rods and the cylinder spigots, cases and even the bottom of the piston skirts has changed and all of those clearances need to be checked. 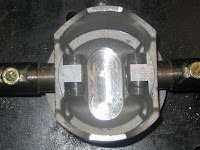 Other areas that need to be checked for a minimum of .060" clearance are; piston to piston at BDC as shown in the center picture above, piston to flywheel also shown in the center picture, and rod to cylinder spigot and crankcase as shown in the other two pictures above. Note that it is possible to check these clearances with the flywheels fully assembled, but it is much easier to see the piston to flywheel when performed with only one half. Once all stroker clearances are verified, the flywheels can be balanced. 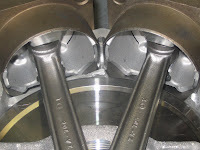 In this particular case, though, I felt it would be worthwhile to lighten the pistons as much as practical in order to lessen the stress on the antique connecting rods. Lightening pistons can be a real art (or science) in itself, and there are businesses that specialize in that sort of thing. 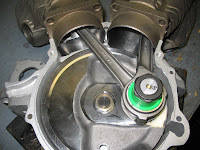 The key is to avoid weakening the piston or distorting it. I have lightened quite a number of pistons over my years of drag racing, and so felt comfortable in doing the work myself. Yes, the pistons undoubtedly would have come out lighter if I had sent them to a specialty shop, (mostly due to my being conservative) but the extra expense was not in the budget. 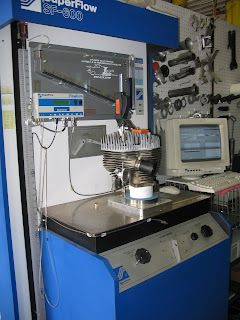 Static balancing of Harley flywheels is a process of weighing the individual pieces (crankpin, bearings, retainers, rods, pistons, rings, wrist pins, etc.) computing a balance bob weight from those figures and employing gravity to tell you when you have achieved a "balance". 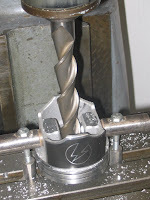 The actual modification is done by drilling holes in the perimeter of the flywheel. I put the word balance in quotes because on a Harley engine with its v twin configuration, what you are really striving for is the best compromise for the least vibration in the rpm range where the engine will spend the majority of its time. You will often hear the term "balance factor" used in relation to Harley flywheels. This is the % of the total reciprocating weight that is added to the rotating weight to give the bob weight. My personal rule of thumb is to use a 60% factor for light flywheels such as S&S (where both flywheel halves are about the same size) and 55% for old style OEM flywheels (where the left flywheel half is considerably heavier) Last time I counted (8 or 9 years ago) I had balanced well over 100 sets of flywheels using this method without any negative feedback. Last row of pictures, from left to right: Weighing crankpin, bearings, etc. 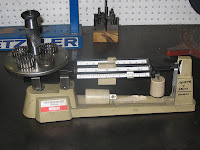 Balance shaft and bob weights. 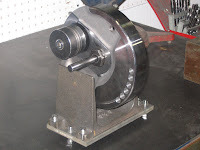 Static balancing one flywheel half. That phrase had often bothered me. After all, David was an adulterer, he was a murderer in "arranging" the death of Bathsheba's husband. David made quite a few other mistakes that are documented in the Bible. In other words David was a SINNER. How could he be "a man after God's own heart?" Pastor Voigt answered that for me quite nicely in his sermon. David was a man after God's own heart, in other words what God's heart wanted was what David's heart wanted! You see, I had been misinterpreting that phrase all these years. I had taken it as David's actions were what David's heart wanted. I should have been understanding the phrase in light of Romans 7:14-20 "For we know that the law is spiritual: but I am carnal, sold under sin. For that which I do I allow not: for what I would, that do I not; but what I hate, that do I. If then I do that which I would not, I consent unto the law that it is good. Now then it is no more I that do it, but sin that dwelleth in me. For I know that in me (that is, in my flesh,) dwelleth no good thing: for to will is present with me; but how to perform that which is good I find not. For the good that I would I do not: but the evil which I would not, that I do. Now if I do that I would not, it is no more I that do it, but sin that dwelleth in me." Just as in Paul's flesh dwelt no good thing, neither did any good thing dwell in David's flesh, and obviously no good thing dwells in my flesh. But now, in the spirit, that's a whole different matter! It all makes a little more sense to me now. The second half of "port and relieve" is, of course, "relieve." 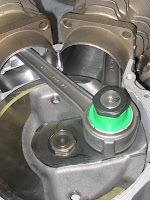 It refers to the process of removing material between the edge of the valve and the cylinder bore. This is done to facilitate airflow, the thinking being that removing material in this area will give a better path for the fuel air mixture to travel as it exits the valve and makes it's way down into the cylinder. The "relieving" had also been done on Joe's cylinders well before I got to them. As with the stock size intake valve and grossly oversize exhaust valve, the relieving had been done favoring the exhaust. In other words, the relief had been made deeper between the exhaust valve and the bore than between the intake valve and the bore. There was not a lot that I could do about this, other than smoothing out the job that was already done and making the reliefs the same from cylinder to cylinder. I was alarmed at one point that the top ring would be too close to the bottom of the exhaust relief, exposing it to too much heat. As it worked out, by the time I had fabricated a thin "stroker" plate to go under the cylinder base to adjust the squish, the top ring was a safe distance below the relief (barely). Now...., the way I would have liked to have approached the matter of relieving is a little different. What I would have liked to have done is treated the area between the valves and the cylinder bore like a port. Consider the floor of the "port" to be the area between the valve and the cylinder bore, which would make the roof of the port to be combustion chamber in the head. My thought is that the floor would respond better to having each "end" radiused rather than the entire floor lowered. 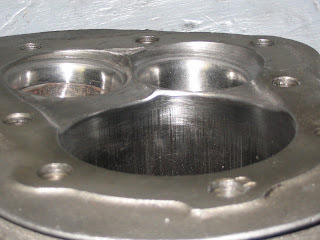 If the actual size of this passage between the valve and cylinder bore needed to be enlarged, it may be better to remove the material from the roof. Alas, with the relief work that was already in place on these cylinders, there was little to be done in the way of research and development. Another area that was an obvious problem area was in the valve pockets in the heads. In fact, during initial mock up, not all of the valves would even open completely with the heads in place. Opening up the heads to match the head gasket solved the clearance problem, as well as unshrouding the valve s for better airflow. Whether this interference was entirely due to the oversize valves or not is questionable. 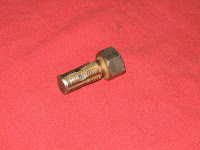 Joe had purchased new reproduction aluminum heads for his motor. 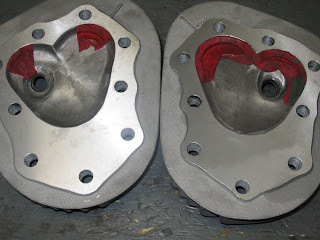 Many of the head bolt holes in these heads had to be modified in order to allow them to align with the gasket and the holes in the cylinders. (Having to modify new aftermarket parts to make them fit is pretty much the standard of the industry, so please keep that in mind next time you think your local Harley mechanic charges you too much or is too slow) If the manufacturer could not even get the head bolt holes in the right place, what are the chances the chambers in the heads were put in the right place? And yes, there are apparently several different manufacturers of these heads, so don't condemn all of them because of my bad experience. I just received another set of aluminum side valve heads from a different manufacturer for another customer and the head bolt holes all lined up perfectly. One last note, the intake manifold also needed a bit of work. I already knew that a deep V in the manifold hurts flow from testing I had done on Shovel and Evo manifolds. Since this manifold had to be made slightly wider to make up for the stroker plates, and I also wanted to convert to a "rubber band" style seal in place of the "plumber style", it only made sense to fill in the V while I was welding. With the V filled in from the outside, I was able to open it up on the inside without grinding through. I fabricated a couple of sleeves to widen the manifold as well as increase the O.D. 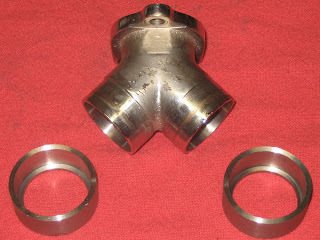 to the came size as the intake spigots. More than a few trips to the flow bench were involved to verify and provide future reference.